Dear Catalog CEOs: Happy New Year! For many of you, the fiscal year ended last Saturday, or ends next Saturday. For some, the fiscal year ends in four weeks. Maybe it is time to take a moment, and enjoy the year that is about to unfold. Be honest --- most pundits have been wrong. Half of them told you that your business model is "dead". It isn't. The other half told you that you had to dive into retail and all these zany omnichannel solutions that keep pundits in business ... and if you didn't do what they told you to do, you'd be dead. Are you still in business? Profitable? 10% pre-tax profit? Obviously, you're doing something right, aren't you? So take a moment, and enjoy all the good things you've done in recent years. And get ready to enjoy 2013. These areas are critically important. Stop mailing catalogs to online-focused buyers (Jennifer, Jasmine). Mail even more catalogs to call-center focused buyers (Judy). Reallocate cost savings to free shipping with a hurdle. It's time to stop operating out of fear (USPS solvency, for instance). Instead, focus on your strengths, and be happy with all of the things you do well. You sell merchandise. That never changes, regardless of the mix of channels being utilized. Take a look a recent simulation I ran --- these customers purchased four times last year. We can all agree that a customer who purchased four times last year is a good customer, right? Look at what happens! These customers perform worse over time, don't they? Now, you can't just "make customers more loyal" by offering discounts and promotions and points and all the other games that we try to do. No, those things only delay the inevitable. The vast majority of customers are not part of a "life cycle". We don't build customers up over time. The vast majority of customers are on a downward trajectory. You can't see this if you don't perform annual analytics, or if you don't run simulations. All you see are conversion-based metrics. You know the details, you don't understand the behavior! There is nothing more important for businesses under a billion in annual sales than to acquire new customers. 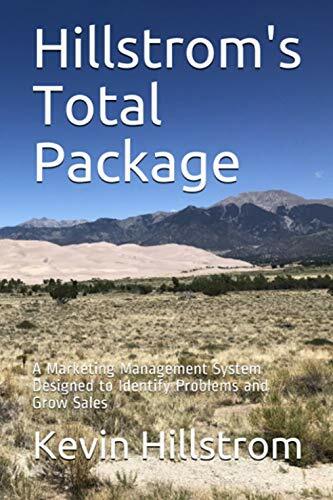 And here's the good thing ... if you're under a billion in annual sales, there are an overwhelming number of prospects out there waiting to become new customers! Run your own simulation, and find out truths like this for yourself. Outside of offering deep discounts on merchandise that your customers didn't want, what are you planning on doing over the next two weeks, with half of your employees out of the office? Maybe, in the spirit of Boxing Day (click here), it's time to think differently. Give this a try. Work with the brightest five employees you have under the age of 30. Give them a task - if they were to reinvent your business, what would their version of reinvention look like? Merchandising strategy? Marketing strategy? Give them a deadline of January 4. That's two weeks. See what this team of over-achieving professionals can create. I'll bet it is fundamentally different than your plan for 2013. What have you go to lose? Give it a try. From time to time, I work on projects where the goal is to set up various triggers. This can be a complicated problem, because customers might perform competing activities. Old-School Catalog orders have a half-life of maybe 24 months. E-Commerce orders have a half-life of maybe 20 months. In-Store retail purchases have a half-life of maybe 16 months. A click through an email campaign may have a half-life of 2 months. A visit to a website may have a half-life of 2 weeks. A social media action may have a half-life of 2 days. Again, your mileage will vary. But it's your job to know the half-life of all activities! If a customer visits your website on December 13, but purchased in a retail store on December 1, it is quite likely that the retail transaction will carry more weight ... any triggers you plan are focused more on the retail transaction than the website visit. Know the half-life of all customer activities. How do you know if your business is heading off the fiscal cliff? Certainly free cash flow and profitability matter. Those are the easy ones. An unplanned drop in new customer acquisition. 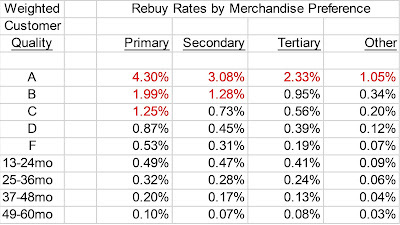 An unplanned drop in the annual repurchase rate among 1x buyers last year (not loyal buyers, but those with only 1 purchase last year). A planned increase in Average Order Value that is achieved. I saw all three at Nordstrom, back in late 2006 and early 2007. Not a soul would listen to me, of course, because we were posting +5% comps. All three were harbingers of the impending collapse of the global economy. Be wary when you hear Management talk about planned strategies to increase Average Order Values. The parallel in the fiscal cliff debate is raising taxes on those who can afford it ... regardless whether you believe that is right or wrong, all organizations facing a cash crisis look to "squeeze more out of the lemon", as an Executive recently told me. It's logical to try to get more out of those who can seemingly afford it. In e-commerce, that's what increasing AOV is all about, among your best customers. If all three of these things are happening simultaneously, your company may be on the verge of going over the fiscal cliff. 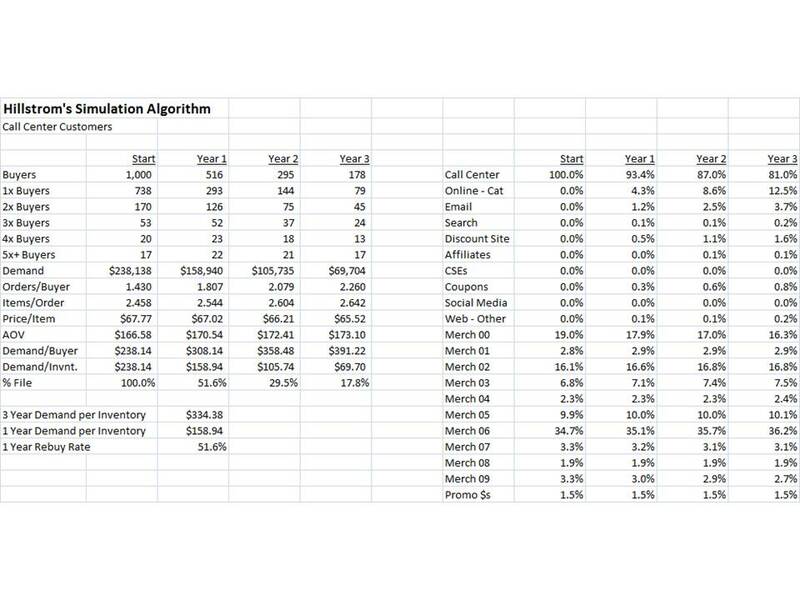 Take a look at the image below - this is from a recent simulation I ran - we're analyzing the migration of 1,000 call center buyers. In three years, 81% of the demand from call center customer demand will still be sourced from the call center. Back in 2006, 81% of call center customers would have migrated online within three years. I can't over-state the importance of this trend, my friends. Simply put, the transition of customers from old-school channels to e-commerce is over. Yes, sure, customers are still migrating. But more important, the vast majority have completed their migration. This has huge ramifications for the businesses we manage. Ramification #1: The catalog is changing. Call center buyers (unless you're buying a $500 item that requires human contact to complete the transaction) are largely Judy or June ... in other words, age 55+. These customers have very different needs than Jennifer or Jasmine. There is nothing wrong with creating separate business units that target June / Judy ... the 55+ call center buyer. This will be a lucrative niche, one that may have a 20 year shelf life of profitable opportunities. Tell me what is wrong with that? You do not have to serve all customers age 18-98. 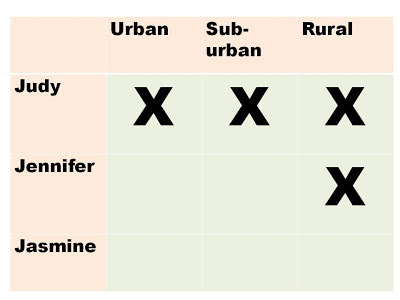 Ramification #2: The catalog has some meaning to Jennifer, minimal or no meaning to Jasmine. Back in 2006, online buyers happily shifted back to the call center (and vice versa), leading to multi-channel nirvana. But once the customer is fully trained to use e-commerce and online channels (especially email), the catalog becomes a secondary demand driver. There's huge cost savings to be had here. In fact, you can pay for free shipping with hurdle promotional program (all year) by taking advantage of the cost savings here. Surprisingly, not many catalogers want to take advantage of this opportunity, because if "feels" wrong to not mail catalogs to customers. In 2013 and 2014, catalogers have an opportunity to shift dollars from unproductive catalog mailings to productive shipping tactics. Ramification #3: The shift from e-commerce to mobile is coming. Outside of e-commerce, it's already happening. Maybe this won't be on a phone, but it will be somewhere between a 4" display, a 7" display, or a 10" display, +/-. We've been experiencing channel migration for forty years ... we went from mailing in checks to call centers with credit cards (that was a huge transition) ... we went from call centers with credit cards to e-commerce ... now we're going from e-commerce to an intermediate device (maybe tablets). By the way, this doesn't guarantee that tablet commerce is the next step. Lots of people are going to try lots of different ways to get customers to shop on intermediate devices ... the customer is going to choose the "right" device / experience combination. Regardless, customers are always migrating from older channels to newer channels ... it's been happening for decades (or longer). E-commerce experts keep bragging about posting +10s and +20s year after year after year ... strongly benefiting from the shift from call centers to e-commerce. The same dynamic is going to haunt e-commerce experts when mobile arrives upon a preferred method of demand capture with customers. Ramification #4: Channel migration business skills will be VERY important. There will be leaders who know how to manage transitions between channels ... these leaders know the inflection points where/when the organization must pivot. With the call center to e-commerce transition complete, there will be opportunities for business leaders with knowledge of this transition to apply leadership skills to the mobile device transition. Quite possibly, these skills will be ignored by the younger generation of mobile experts (increasingly, extensive old-school skills are ignored in favor of new-channel experimentation) , but that doesn't mean that the skills aren't valuable. Ramification #5: Nothing is directly attributable anymore (and it's been this way for awhile). Measurement gurus will strongly disagree with me, and that's fine. In the old days, you put a key code on the back of a catalog, and you tracked the demand associated with that code to the catalog that caused the order. Sure, there were problems with this methodology, but the problems were in the +/- 15% magnitude. Today, everything is measurable, and yet nothing is definitive. It's a paradox. And it's ok. You have a marketing budget, you kind of know in total what you're marketing efforts are generating. Leadership needs to, believe it or not, leverage gut instinct, when managing the transition from older channels to newer channels. Ramification #6: Simulations will become important. When nothing is directly attributable, it becomes very hard to understand "what to do" or "when to do it". Simulations will allow business leaders to make decisions in a safe environment, playing "what-if" games. Ok, time for your thoughts. Please offer them in the comments section of this post. When you run simulations, you get an opportunity to see how specific customers evolve over time. Take a look at a search buyer. In this simulation, the majority of search-only buyers purchased just one time via search last year. Now look at how these customers evolve over time ... next year, 54% of their dollars are in search ... two years from now it is 28% ... and three years from now it is 14%. In other words, this customer doesn't stay as a search customer, the customer migrates to and uses other channels (in this case, 64% of year three demand is generated via catalogs). Look at the merchandise preferences of the customer ... I list each merchandise category (00 to 09, ten in total) ... notice how the customer evolves out of merchandise category 00 and moves into merchandise category 06. Think about this when figuring out what to market to the "search" customer in the future. Ready for your own simulation? Click here to contact me now! I get a fair amount of feedback about my stance against anything that is "omnichannel". I'm not against omnichannel strategies. I simply struggle with the defense of "omnichannel" on the basis of lizard logic like this ... "omnichannel customers are 294 times more valuable than other customers". The logic is largely hokum. Maybe even bunkum. 2x Buyers Last Year, Single Channel = $236 demand value next twelve months. 2x Buyers Last Year, Omnichannel = $242 demand value next twelve months. 3x Buyers Last Year, Single Channel = $367 demand value next twelve months. 3x Buyers Last Year, Omnichannel = $379 demand value next twelve months. In fact, across the four simulations, omnichannel customers were only 3% more valuable. You probably don't need a simulation to see this ... just run a query, freezing customers at the end of 2011, equalizing them by RFM factors, then measuring the difference in 2012 spend between omnichannel customers and all other customers (after equalization). Being "omnichannel" isn't the solution. Focus on products that customers crave (yes, I realize that's hard to do). Run the query above, or run your own simulation ... let us know what you learn! Principle #2 = We price our products fairly and honestly. We do not, and have not, and will not participate in the common retailing practice of inflating mark-ups to set up a future phony 'sale'. Now, I know you have more important things to tend to in Heaven, things like averting the end of the world on December 21 and helping our leaders avoid the fiscal cliff, but I thought you might want to see how Principle #2 evolved in the past decade. Normal Business = $105 merchandise + $14.95 shipping and handling = $119.95. This Promotion = $105 merchandise - $40 discount + $0.00 S/H = $65.00. If the cost of goods sold is 40% and shipping/handing is assumed to truly cost about $7 per order (ignoring the human costs to pick/pack/ship merchandise), then we're looking at about $71 profit under normal business conditions, and $16 profit via this promotion ... requiring the promotion to drive a 340% increase in orders to equalize profit. If my assumptions are off, they're not off far enough to fundamentally change the story. Mr. Comer, you might be surprised to learn that, in 2012, this is considered a "best practice" in the e-commerce industry. Trade journalists, bloggers, vendors, research organizations, and consultants achieved consensus on this topic around the time of the Great Recession. Because we have consensus, it has to be a best practice to accept $16 profit per order over $71 profit per order in order to maintain market share. Experts will point to JCP, who eliminated discounts and promotions in favor of fair, everyday pricing, and saw same-store sales drop 25%. Experts conveniently ignore companies like Apple, who adhere to your principle and have more cash on hand than the US Treasury. Mr. Comer, I recall spirited discussions that leadership had with you in 1992. They asked me to analyze tests where we priced mock turtlenecks at $12 each, or 2 for $23. We had extensive debates whether this strategy violated Principle #2. Those were great times. In 2012, with the advent of Cyber Monday and now Green Monday, our industry believes that Principle #2 places the industry at a competitive disadvantage. We used to argue about ways to discount one product out of ten thousand by 4%. Twenty years later, we discount all products by 40%, plus free shipping. At the current rate of promotional acceleration, we'll be discounting by between 75% and 80% in the year 2032. Thank you, Mr. Comer, for taking a few moments from your busy schedule to hear this update about modern e-commerce. Use of simulations are commonplace. We wouldn't be having vibrant discussions about global warming unless somebody ran a simulation illustrating a forthcoming train wreck. And nearly every day, your television station provides you with a four or five or seven day weather forecast ... and it's reasonably accurate. Weather forecasters are running a myriad of simulations, then they forecast the future. Remember the movie Apollo 13? The simulator was pretty important in getting folks back to Earth. And that was more than 40 years ago. Formula 1 race car drivers hopped into the simulator to test the new race track in Austin, Texas. Why, in e-commerce, do we not use simulations? We don't have to over-complicate the creation of simulations. Let's use a very simple example. I take two snapshots of the twelve-month file, one from October 10 - November 9, then another from November 10 - December 9. I record key attributes about each customer ... recency ... frequency ... monetary value ... channel preference ... merchandise preference ... Christmas shopping preference ... price point preference ... free shipping preference ... discounts/promo preference. Allow me to over-simplify for a moment, to demonstrate how I run my simulations. Let's pretend that in the 10/10 - 11/9 timeframe, I segment customers as good, average, and poor. Then let's pretend that in the 11/10 - 12/9 timeframe, I segment customers using the exact same criteria ... good, average, and poor. 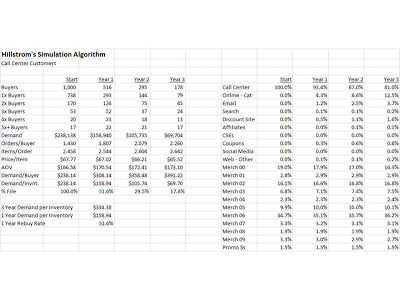 Toss in new customers, assigning them to good/average/poor, and we have a 4x4 matrix. 1000 * 0.40 = 400 will become good customers next month. 1000 * 0.40 = 400 will still be average customers next month. 1000 * 0.15 = 150 will become poor customers next month. 1000 * 0.05 = 50 will not be active, and will leave the simulation next month. This process is repeated for each row, giving us the count of customers starting next month in the simulation. This process is repeated, month after month after month, yielding simulated results for your business over time. This is a 4x4 example. My methodology utilizes a 1,000,000,000 x 1,000,000,000 matrix ... the matrix takes no extra work to program in a computer than a 4x4 matrix used in our example (though many of my models work on a 500 x 500 matrix, FYI). I append 12-month spend values across channels and merchandise categories, yielding simulated sales totals for the business. See, this doesn't have to be terribly difficult. And yet, simulated results yield discoveries that are not easily obtained via normal queries. Yes, we need to execute e-commerce simulations. We're decades behind other industries. The time is now. Get busy! Multiple touchpoints (frequently referred to as multi-channel or omnichannel) happen when the customer is in a state of transition. And when a customer is in a stage of transition, those who manage old-school channels try to stitch together a version of the future that includes the old-school channel. If you actually analyze your own customer behavior, you'll see a couple of interesting trends. Old-school multi-channel transition is largely over ... customers shifted from catalogs and call centers to e-commerce and search and email. 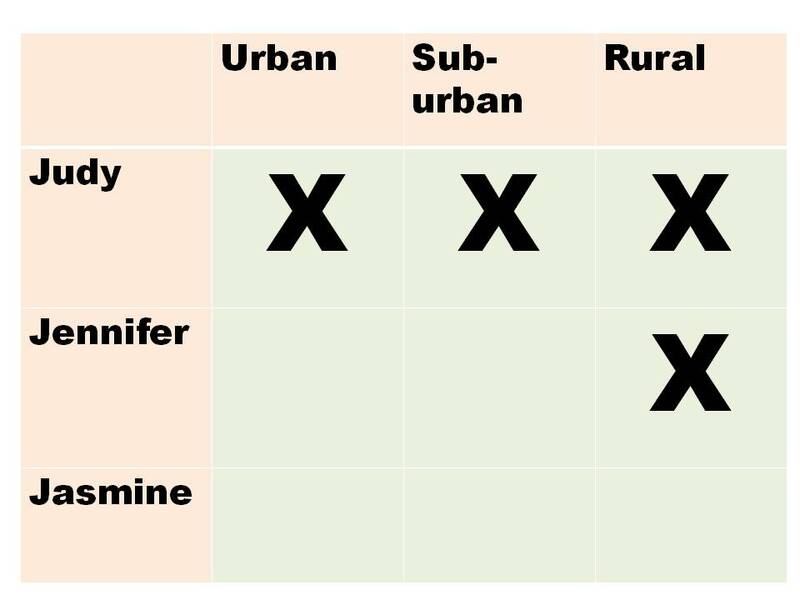 55+ rural customers held on to old-school channels, while 35-51 year old customers moved to e-commerce, search, and email. This transition largely happened between 2002 and 2008. It is over. Run a migration probability table, it will tell you the truth! Classic e-commerce transition is beginning ... customers age 19-35 are transitioning from e-commerce, search, and email to local/social/mobile. Because we measure this in aggregate, it looks like "everybody" is making the change. Not true. Overlay demographic data on top of these trends ... omnichannel is much more about 19-35 year olds moving away from e-commerce/email/search than it is about everybody doing everything. We're just measuring the trend incorrectly. This "omnichannel" or "multiple touchpoint" transition will happen for several years. Because research organizations, trade journalists, and bloggers don't have access to data within companies, they will report on overall trends, not segmented by demographic cohorts. Their observations will suggest that "everybody" is doing "everything". Dig in to your own data ... perform demographic overlays on your customer file ... and observe unique trends. Run a migration probability table! Judy is largely sticking with old-school tactics, but will dip a toe in e-commerce. Jennifer prefers classic e-commerce, but will dip a toe in mobile/social/local. Jasmine is transitioning to newer channels. When you hear media buzz about omnichannel, think Jasmine. In a "Big Data" world, we're told that we need to collect all sorts of data from all sorts of sources, yielding an "omni-channel" view of the world. Now, I want for you to watch this time lapse video. Essentially, one image is taken every twenty seconds during the course of the day ... in other words, the majority of the data has been stripped out of this video. Artistically, the video is interesting, right? But more important, look at what happens to our understanding of that day when we strip out the vast majority of information. By removing data (not by adding data), we are left with a unique story to convey. The same thing happens with that hyped-up fad known as "Big Data", doesn't it? We spend all of our time trying to combine data from different sources, so that we can find nuggets of actionable insights. Now, sure, a Big Data advocate would say that you could collect all of the data, and then just accelerate the data so that the end result is the same as the video above. Have at it. But what would happen if we do the opposite? What happens if we strip out all of the junk, the noise, so that we're left with only the good stuff, the "signal"? Are My Customers Permanently Switching To Mobile? We all lived through the transition from old-school direct marketing to e-commerce. 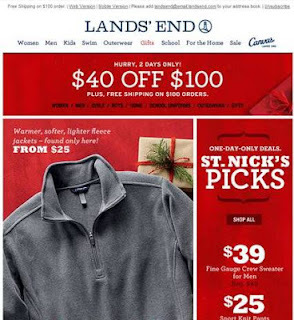 E-commerce was a fad (customers tried it, then went back to old-school direct marketing). E-commerce became mainstream (customers switched, in large numbers, and did not go back to old-school direct marketing). E-commerce became boring (customers returned to normal behavior, just in a new channel, with some customers choosing to not make the switch). We're beginning the same process with mobile. While the pundits hound you about the myriad ways your business is stuck in the stone ages (e-commerce), your peers are doing research to see whether we're in (1) (2) (3) above. It's easy to see if we're in (1) (2) (3) above. Go back to our Multichannel Forensics framework of 2007, and apply it to e-commerce vs. mobile. Query: Capture all customers who purchased via e-commerce or mobile between November 2011 and October 2012. Within this audience, tabulate how many customers purchased via e-commerce or mobile in November 2012. Then, we calculate the classic website (e-commerce) and mobile index metrics (remember, the migration probability matrix is the probability of buying from a channel in the future, divided by the probability of buying in the future). 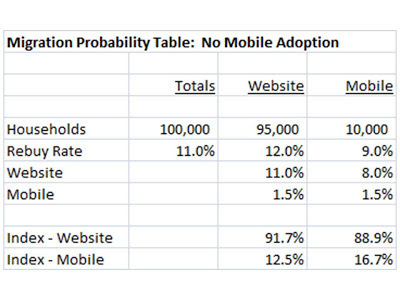 This table shows what happens when customers are trying mobile, but are not adopting it as a primary channel. As you can see, customers who purchased via mobile last year switched back to e-commerce. Customers are not comfortable making the switch. Look at this table. 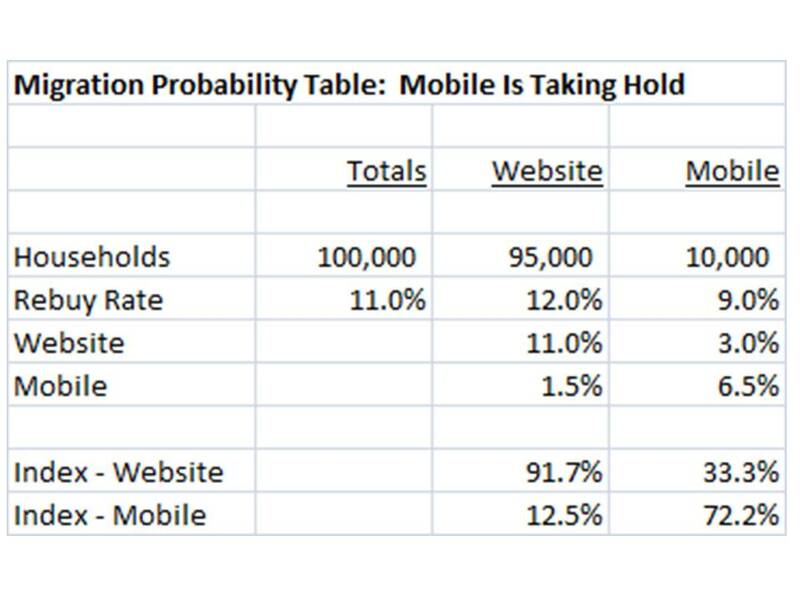 This is what it looks like when customers are getting ready to make the switch to mobile --- website customers are not defecting to mobile, but mobile customers are not switching back to the website. Remember, an index > 20% means customers want to switch. When the table looks like this, mobile has taken hold. Mainstream customers are not willing to make the switch, but mobile advocates have switched, and are not as likely to go back to the e-commerce experience. This is such a key transitional phase ... it has to be measured and understood. When this happens, you make organizational changes ... you move the focus from e-commerce to mobile, even though e-commerce is where the sales still happen. Your customer is making the change, at this point. When your query results look like this, customers have made the shift, and mobile is about to become the dominant channel. Mobile customers have moved beyond e-commerce, they are unlikely to switch. Conversely, e-commerce buyers are migrating to mobile. When your query looks like this, mobile is truly your future. Which of the three scenarios fits your business? It's easy to run the query. Your analytics expert, digital analyst, or web analytics professional should be able to pound out this query in 15 minutes. Run the query this afternoon. Share the results with your Executive Team. It is not hard to understand where your customer is in the mobile transition. Stop listening to trade journalists and bloggers, folks who don't even have access to your customer database. Analyze your own data, and make your own decisions! !